The tax rate may increase as taxable income increases (referred to as graduated or progressive rates). The tax imposed on companies is usually known as corporate tax and is levied at a flat rate. However, individuals are taxed at various rates according to the band in which they fall. Further, the partnership firms are also taxed at flat rate. Most jurisdictions exempt locally organized charitable organizations from tax. Capital gains may be taxed at different rates than other income. Credits of various sorts may be allowed that reduce tax. Some jurisdictions impose the higher of an income tax or a tax on an alternative base or measure of income. The inception date of the modern income tax is typically accepted as 1799, at the suggestion of Henry Beeke, the future Dean of Bristol. This income tax was introduced into Great Britain by Prime Minister William Pitt the Younger in his budget of December 1798, to pay for weapons and equipment for the French Revolutionary War. Pitt's new graduated (progressive) income tax began at a levy of 2 old pence in the pound (1/120) on incomes over £60 (equivalent to £6,200 in 2018), and increased up to a maximum of 2 shillings in the pound (10%) on incomes of over £200. Pitt hoped that the new income tax would raise £10 million a year, but actual receipts for 1799 totalled only a little over £6 million. 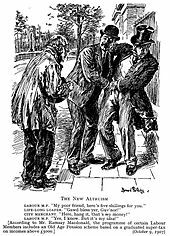 In the United Kingdom of Great Britain and Ireland, income tax was reintroduced by Sir Robert Peel by the Income Tax Act 1842. Peel, as a Conservative, had opposed income tax in the 1841 general election, but a growing budget deficit required a new source of funds. The new income tax, based on Addington's model, was imposed on incomes above £150 (equivalent to £13,870 in 2018),. Although this measure was initially intended to be temporary, it soon became a fixture of the British taxation system. The US federal government imposed the first personal income tax on August 5, 1861, to help pay for its war effort in the American Civil War - (3% of all incomes over US$800) (equivalent to $22,300 in 2018). This tax was repealed and replaced by another income tax in 1862. It was only in 1894 that the first peacetime income tax was passed through the Wilson-Gorman tariff. The rate was 2% on income over $4000 (equivalent to $116,000 in 2018), which meant fewer than 10% of households would pay any. The purpose of the income tax was to make up for revenue that would be lost by tariff reductions. The US Supreme Court ruled the income tax unconstitutional, the 10th amendment forbidding any powers not expressed in the US Constitution, and there being no power to impose any other than a direct tax by apportionment. Individuals are often taxed at different rates than corporations. Individuals include only human beings. Tax systems in countries other than the USA treat an entity as a corporation only if it is legally organized as a corporation. Estates and trusts are usually subject to special tax provisions. Other taxable entities are generally treated as partnerships. In the US, many kinds of entities may elect to be treated as a corporation or a partnership. Partners of partnerships are treated as having income, deductions, and credits equal to their shares of such partnership items. Residents are generally taxed differently from nonresidents. Few jurisdictions tax nonresidents other than on specific types of income earned within the jurisdiction. See, e.g., the discussion of taxation by the United States of foreign persons. Residents, however, are generally subject to income tax on all worldwide income. [notes 1] A very few countries (notably Singapore and Hong Kong) tax residents only on income earned in or remitted to the country. Income taxes of workers are often collected by employers under a withholding or pay-as-you-earn tax system. Such collections are not necessarily final amounts of tax, as the worker may be required to aggregate wage income with other income and/or deductions to determine actual tax. Calculation of the tax to be withheld may be done by the government or by employers based on withholding allowances or formulas. Nearly all systems require those whose proper tax is not fully settled through withholding to self-assess tax and make payments prior to or with final determination of the tax. Self-assessment means the taxpayer must make a computation of tax and submit it to the government. Some countries provide a pre-computed estimate to taxpayers, which the taxpayer can correct as necessary. The proportion of people who pay their income taxes in full, on time, and voluntarily (that is, without being fined or ordered to pay more by the government) is called the voluntary compliance rate. The voluntary compliance rate is higher in the US than in countries like Germany or Italy. In countries with a sizeable black market, the voluntary compliance rate is very low and may be impossible to properly calculate. Retirement oriented taxes, such as Social Security or national insurance, also are a type of income tax, though not generally referred to as such. In the US, these taxes generally are imposed at a fixed rate on wages or self-employment earnings up to a maximum amount per year. The tax may be imposed on the employer, the employee, or both, at the same or different rates. Some studies have suggested that an income tax doesn't have much effect on the numbers of hours worked. Income taxes are used in most countries around the world. The tax systems vary greatly and can be progressive, proportional, or regressive, depending on the type of tax. 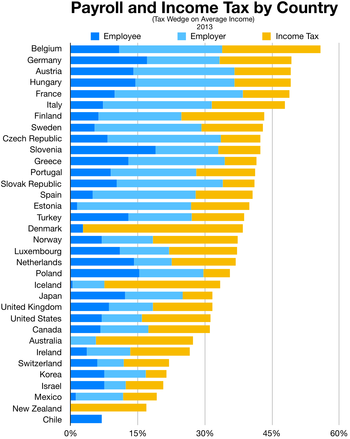 Comparison of tax rates around the world is a difficult and somewhat subjective enterprise. Tax laws in most countries are extremely complex, and tax burden falls differently on different groups in each country and sub-national unit. Of course, services provided by governments in return for taxation also vary, making comparisons all the more difficult. Public disclosure of personal income tax filings occurs in Finland, Norway and Sweden (as of the late-2000s and early 2010s). ^ Peter Harris (2006). Income tax in common law jurisdictions: from the origins to 1820, Volume 1. p. 34. ^ Peter Harris (2006). Income tax in common law jurisdictions: from the origins to 1820, Volume 1. p. 1. ^ The Gentleman's magazine, Vol 161. 1837. pp. 546–7. ^ "A tax to beat Napoleon". HM Revenue & Customs. Archived from the original on July 24, 2010. Retrieved 2007-01-24. ^ POLLACK, SHELDON D. (2013). "The First National Income Tax, 1861–1872" (PDF). University of Delaware. ^ "U.S. Inflation Rate, $800 in 1861 to 2017". CPI Inflation Calculator. ^ Sections 49, 51, and part of 50 repealed by Revenue Act of 1862, sec. 89, ch. 119, 12 Stat. 432, 473 (July 1, 1862); income taxes imposed under Revenue Act of 1862, section 86 (pertaining to salaries of officers, or payments to "persons in the civil, military, naval, or other employment or service of the United States ...") and section 90 (pertaining to "the annual gains, profits, or income of every person residing in the United States, whether derived from any kind of property, rents, interest, dividends, salaries, or from any profession, trade, employment or vocation carried on in the United States or elsewhere, or from any other source whatever...."). ^ "THIRTY-EIGHTH CONGRESS. SESS.. I. C. 173. 1864" (PDF). Library of Congress. ^ Young, Adam (2004-09-07). "The Origin of the Income Tax". Ludwig von Mises Institute. Retrieved 2007-01-24. ^ See, e.g., rates under the Germany and United States systems. ^ See, e.g., gross income in the United States. ^ a b c Chun, Rene (2019-03-10). "Why Americans Don't Cheat on Their Taxes". The Atlantic. Retrieved 2019-03-10. ^ Deadweight Loss Of Taxation, Retrieved 19 August 2013. ^ International tax - France Highlights 2012 Archived October 25, 2012, at the Wayback Machine, Deloitte. ^ International tax - Singapore Highlights 2012 Archived June 3, 2013, at the Wayback Machine, Deloitte. ^ International tax - Brunei Darussalam Archived October 25, 2012, at the Wayback Machine 2012, Deloitte. ^ Bernasek, Anna (February 13, 2010). "Should Tax Bills Be Public Information?". The New York Times. Retrieved 2010-03-07. ^ How much do you make? It'd be no secret in Scandinavia, USA Today, June 18, 2008. ^ The Germany system is typical in this regard.